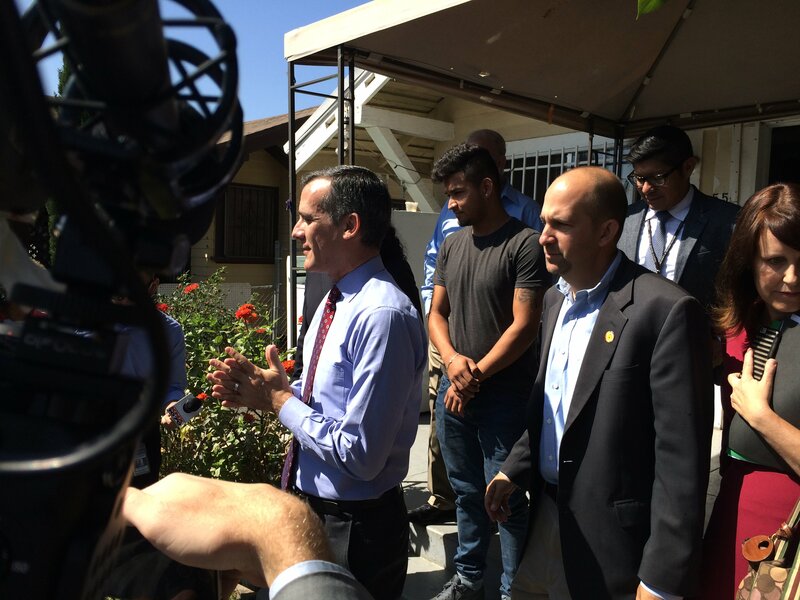 Los Angeles Mayor Eric Garcetti speaks to members of the media outside the home of a high school dropout on LA Unified’s Student Recovery Day. LA Unified officials and a team of volunteers hit the streets Friday, knocking on the doors of high school dropouts in an effort to get them re-enrolled in school as part of the district’s Student Recovery Day. Among the door knockers was Los Angeles Mayor Eric Garcetti, who along with LA Unified Board President Steve Zimmer, board member Scott Schmerelson and Superintendent Michelle King visited the home of a former student living near the campus of USC. After about 20 minutes, as a mass of reporters waited outside, Garcetti and the rest emerged victorious. The young man inside, Jeffery, had agreed to come back to school. Jeffery had apparently dropped out to work and help his family, but Garcetti and Zimmer announced they had convinced him to attend night classes at an adult school so that he could continue with his day job. Not only that, but his cousin may also return to school and his grandma might start attending adult school. Student Recovery Day has been happening for eight years at the district and has resulted in nearly 5,000 students coming back to school. District employees from the central office, school board members and their staff, school personnel and volunteers from organizations like City Year fan out into neighborhoods and contact former students and their families while making them aware of the various services the district can offer. This year, the recovery efforts were focused on dropouts from seven high schools, one in each board district. They were West Adams, Washington Prep, Canoga Park, Bernstein, Marquez, Sun Valley and Dymally high schools. The district reported a total of 230 volunteers visited homes Friday; it will announce next week how many students were visited and recovered. Less than an hour before Garcetti exited Jeffery’s home, a press conference had concluded at West Adams Preparatory High School that featured five students who had either dropped out of school and returned or had faced extreme challenges just to get into school. One was Glenda Abrego, who grew up in El Salvador but decided to make the trek to America by herself. She was arrested at the Mexican border by immigration officials and spent several months in a detention center in Texas before coming to Los Angeles and enrolling at West Adams. Abrego credited the counselors and teachers at West Adams with helping her find housing, financial support, legal aid and helping her learn English. LA Unified school board President Steve Zimmer outside a home on Student Recovery Day. 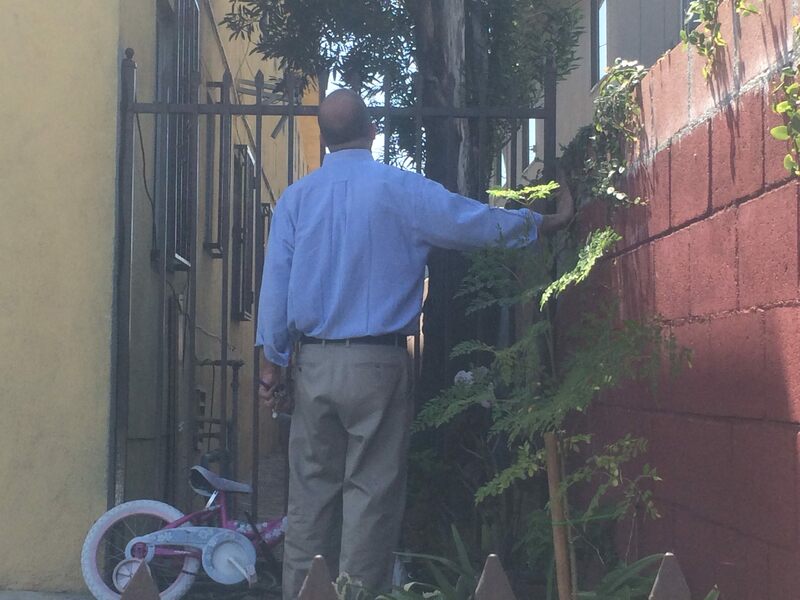 About an hour after the mass of reporters swarmed Garcetti and the other district leaders outside Jeffery’s house, Zimmer stood on a quiet sidewalk next to a few district employees, looking over the fence of an apartment building on the 3000 block of West 12th Street. The address he was looking for didn’t seem to exist on the block, and he and his team had already gone to a different wrong address on 12th Avenue. A staffer made a call, and they realized they were at the wrong address again and should be at West 12th Place, one block over. “This is part of Recovery Day, yes, standing on sidewalks,” Zimmer said when asked if this kind of thing happened often. After driving the one block, Zimmer and his team entered the correct apartment. About 20 minutes later they exited and reported another success. In an hour a team from the district was going to come back and take the young man inside to a nearby continuation school. Zimmer said he was a quiet kid who maybe suffered from some depression and had lost interest in school.